When you check out after using the shopping cart on the website and before you pay, you can choose how you would like your order shipped. We ship Monday, Wednesday, and Friday. Your order can usually be shipped the same day if we receive your payment before 1 P.M. Pacific Time. During the holiday season we ship monday-friday. Priority Mail is generally 2-3 days service, sometimes a little longer..
Express Mail is 1-2 days service. Global Express Mail 3-5 business days. Note: Based on customer feedback orders being sent to Canada seem to be taking longer than usual. 1) First Class Mail with delivery confirmation Only available for smaller orders. Cost varies from $1.75-$3.95. Larger orders will automatically be upgraded to Priority Mail service and rates. Most customers will receive an email at the email address that they used when ordering with their delivery confirmation number. 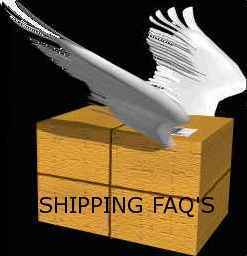 Exceptions are orders with addresses that are not accepted by the shipping system. 2) Priority Mail with delivery confirmation Cost is $6.50 for most orders, but can go up to $15 for very large orders. 3) Express Mail. Cost starts at $23 and generally up to 10-12 items can be sent for that same price. Customers will receive an automatic email with the tracking number at the email they used when placing the order. Shipping Options for Delivery Outside the US. 1)First Class International (Air Mail) Cost starts at $13 for up to 9 ounces (generally two buckles can be sent for this price. The next weight category is 9 ounces to 2 pounds for $22. (generally up to 7 buckles can be sent for this price. The following pound is an additional $11. Canada and Mexico are slightly cheaper than other destination as it is $9.50 for up to 9 ounces and $15 for up to 2 pounds with an additonal $9 for orders up to 3 pounds. 2) Priority Mail International Flat Rate Envelope. Cost is $34 up to $74 for very large orders (except Canada and Mexico which are $24 and $45 for very large orders) Up to 10 items can be sent for the lesser rate. Customer will receive automatic email notification of the label number of their order at the email address that they used when ordering. 3) Global Express Mail. Flat Rate Envelope. Cost $61 and up. (Canada and Mexico are $40 and up) Up to 10 items can be sent at this base rate. Customer will receive automatic email notification with the tracking number for your order.